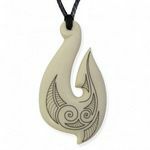 This pendant is in the shape of a stylised Maori fish hook known as the hei-matau (pronounced hay-may-tow), matau meaning hook. 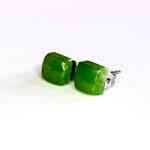 Measures: 30mm wide, 50mm long. 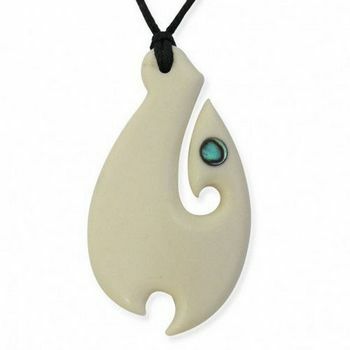 The Fish Hook (matau) was very important to the Maori. 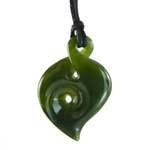 Fishing provided a large part of their Kai Moana or 'Food from the sea'. 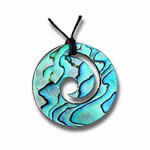 However it was also important for trade and making the tribe wealthy. 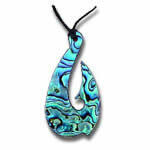 Today's fish hook's do not have the practical application they once did, they are now decorative versions and strictly for wearing. 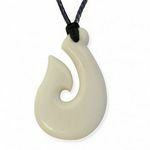 It is believed that the hei-matau and many other fish-like amulets, more common in the south, may have been worn as talismans during fishing expeditions. 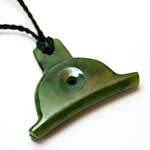 The Hei Matau sigifies Abundance and plenty, strength and determination, it brings peace, prosperity and good health. 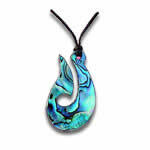 It is a device for catching good luck and positive energy and provides a safe journey over water.